The inhabitants of the villages along the Wine Route attach great importance to traditions and culture. Customs and traditions are of utmost importance to the inhabitants of the villages along the Wine Route. Numerous events liven up the village, there are processions, festivals and colourful parades. Many traditions have been preserved for centuries and still colour the lives in the villages. Lasting impressions that are ready to be taken home. The event of cultural nature are going to sweeten your holidays in this beautiful area. The inhabitants of Salorno know how to celebrate the period of Carnival. Huge wine event along the South Tyrolean Wine Route. 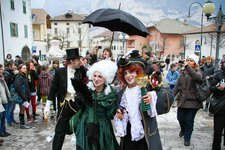 No matter how you call it, Carnival is above all celebrated in the south of Bolzano. Hungry harvesters are rewarded with a tasty meal still today. Today this tradition is still practiced in some houses. A long time ago, the Saltner protected the vineyard from all kinds of thieves.